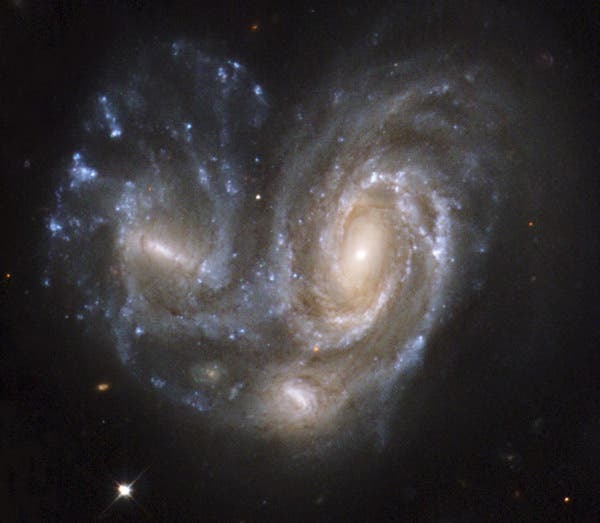 Galaxies frequently collide with one another. Our own Milky Way galaxy, for example, and its nearest giant neighbor, the Andromeda galaxy, are heading towards each other at a rate of about 120 kilometers per second; predictions claim the two will merge together in another four billion years or so. It is not only the future of our home galaxy that interests scientists. These powerful interactions are thought to help produce stars, feed the massive black holes that sit at the cores of galaxies, and in general influence in fundamental ways the development and evolution of galaxies. According to theory, the later stages of a galaxy's growth are the ones dominated by sporadic collisions; in the earlier stages a galaxy steadily accumulates material from its surroundings. These early phases should dominate the nature of stars in the older, inner regions of a galaxy, whereas interactions dominate the stars in the outer regions. The two sets of stars are demonstrably different, distinguished by the relative abundances of their elements in the sense that heavier elements signal older, evolved stars. A galaxy's globular clusters can provide a measure of a galaxy's element abundances, and how they vary. A globular cluster is a roughly spherical ensemble of stars (as many as several million) that are gravitationally bound together and typically located in the outer regions of galaxies. CfA astronomer Jay Strader, together with five colleagues, has examined the family of about 2600 globular clusters around the giant elliptical galaxy NGC1407, which is interacting with its neighbor, NGC1400. The team reports finding a strong variation in the elemental abundances of the globular clusters, with those closer to the galaxy having more heavier elements. The evidence provides strong confirmation of the overall model in which the inner regions formed earlier, by steady accumulation, whereas the more distant, outer regions, which were involved in more recent interactions, are younger. Elliptical galaxies have long been thought to form when two smaller spiral-shaped galaxies collide. They range in shapes from a flattened cigar shape to a spherical shape. They also range in size from dwarfs to supermassive giants. You will usually find elliptical galaxies near the center of galaxy clusters.